Jack Broadbent serves as the Chief Executive Officer/Air Pollution Control Officer, for the Bay Area Air Quality Management District. In this position, Mr. Broadbent is responsible for directing the Air District's programs to achieve and maintain healthy air quality for the seven million people that reside in the nine county region of California's San Francisco Bay Area. 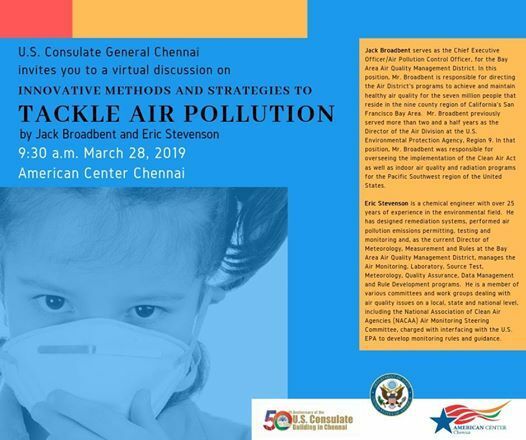 Mr. Broadbent previously served more than two and a half years as the Director of the Air Division at the U.S. Environmental Protection Agency, Region 9. 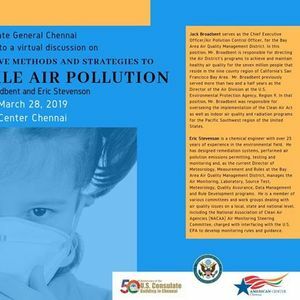 In that position, Mr. Broadbent was responsible for overseeing the implementation of the Clean Air Act as well as indoor air quality and radiation programs for the Pacific Southwest region of the United States. Please plan to arrive at the Cathedral Road entrance of the U.S. Consulate by 9:00 a.m. Please carry an original, valid, government-issued photo id such as Voter ID, Passport, Drivers’ License or PAN Card. Cellphones must be deposited at the security counter of the Consulate. No other electronic device is permitted including iPad/Notebook/Laptop etc. Please note that there are no parking facilities for visitors within the Consulate premises.